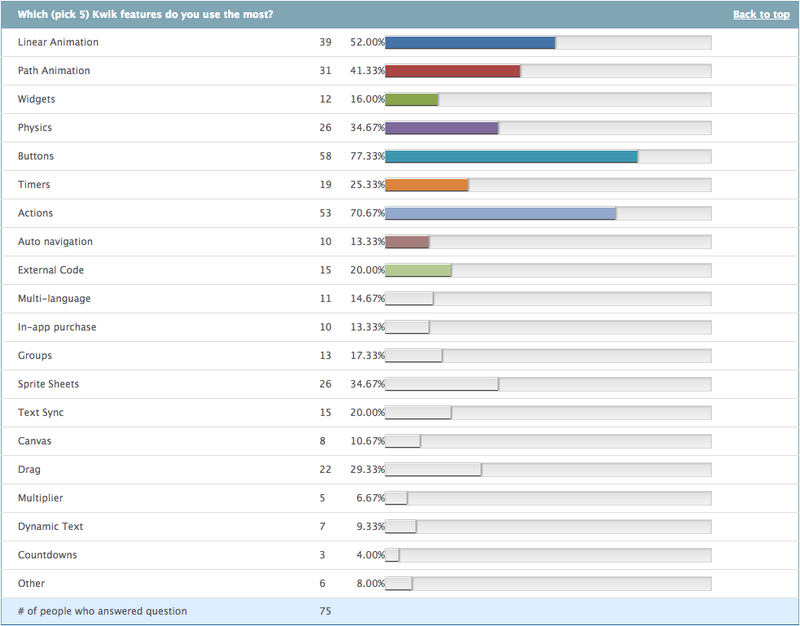 Few days ago we sent a survey to all Kwik users, asking them to help the “Kwik Next” generation of features. 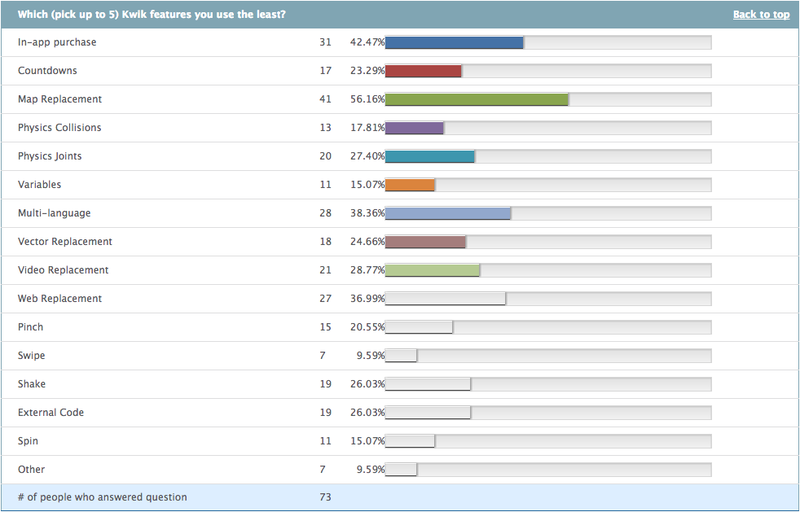 Here the results and answers to ALL open questions/suggestions/complains. Thanks again for your participation! Besides the basic buttons and actions (everybody need them, right? ), clearly animations (linear and path) are in the top. Physics and Sprite Sheets were well voted/used as well. Your input here will help to add new features or improve existing ones. Which features are used the least? Clearly, almost anyone have used Maps and a few other futures. I wasn’t expecting a large number of people mentioning not using In-app purchase (second most voted) and multi-language (the third most voted). Your input here will help us to avoid adding features that not many will use. Which features do you miss the most? Below the list of comments (in italics and bold), with my answers just after. It seems Corona PRO (coming soon) will bring that. Accelerometer is in the list but, considering that are lots of things you can do with accelerometer sensors, which ones do you miss the most? Examples? 3) none at this moment, Nothing, Kwik is awesome., I am just at the beginning with Kwik. I am saving up to buy and in the mean time I am learning and creating page mockups for the book app I wish to create. Every time I use the plug in, I like it more., N/A (still in the process of trying out), I am new to this so I am still discovering what works and doesnt work for me. Love it so far! It has such potential I really think it will be the answer my company has been looking for. 4) animating things as in Flash, Live editing with instant visual feedback. I am assuming the suggestion here is to have a timeline for animations, right? Unfortunately I did not understand this one. Can you please provide more info? 7) Some of these I don’t use only because I don’t know how, but I really would like to. I miss Social Media integration. Not sure what else yet, just getting into creating apps outside of what I already know in Kwik. But LOVE Kwik so far. Great work Alex. Thanks for the words! Social media integration for what: share the page being seen in Facebook? Send a tweet from the app? Follow a Facebook page? As the topic is a little big, could you provide more info (please don’t say “everything”:))? 8) I tell you ideas (very complicated ones ) : code editing integrated (after generation you can use the adobe Extended Script editor for example…) , Camera integration : help to use the cam and to put in the correct layer after, Parallax scrolling helper, Tile Map, connection with Lua Glider IDE to help on debugger. It is not in my plans to make Kwik a “for everything tool” (you can see by the number of features not being used above). Kwik focus are designers (not developers) so, do not expect code editing, tile map, Glider connection, etc. Camera integration and Parallax are in the list. Assuming both are referring to “Spine” integration (feel free to correct me here, if I am wrong), this is in list already. 10) Real coloring. Better Collisions. Extra functionality with physics. It seems that Corona PRO (coming soon) will bring bitmap manipulation features that will help the “real coloring” part. What do you mean by “better collisions and extra functionality with physics”? Please provide more info here. 11) You need scroll bars in some of your taller pop-up menus if possible. Sometimes , I have a path animation menu and I can’t hit ok because it doesn’t like my resolution and it cuts off the bottom part of the menu with no real way to navigate to it. Having a scroll bar would make it usable. Also, there is a compilation bug I have not figured out yet, where it hangs and doesn’t finish. If any other users have asked for support on it, I’d appreciate if you would post on the faq. Have you tried the latest 2.4 version, which brings a re-designed Linear and Path animation window? I get the issue but, in the other hand, it is hard to keep adding features in a smaller space just to solve a few exceptions (please, no hard feelings here) like yours. Photoshop is usually used in large (many times, dual monitors) configurations and, even when running on notebooks, these seem to have bigger resolutions. I will keep looking for alternatives here. Regarding the bu, please submit it to the forums. 12) I`m writing apps for language learning, and do most of it through external code ( I.e. I don`t use multi-language feature). I would miss most the ability to write external code, as well as the ability to sync audio to text and associate audio with single words. Both things are already available in Kwik. Check the User Guide for more info on how to use them. Due the different screen ratios and sizes of iPhone and iPad, it is almost impossible to use the same set of images and positioning to “non-universal” projects. Any ideas here? 15) I think only animations and means of linking to external databases. I’d like to be able to time-line in the way I can in Flash (well, better than in Flash ideally !) I wouldn’t take out any of the features in q2 though. Regarding “Flash animations/timeline”, check answer 4. About external database, any more details here? Are you talking about SQLite, JSON, external data files (if this is the case, check the User Guide for Track Variables. 16) Automating process when you make several identical apps. Ability to edit build. settings file. See answer 13, also check this tutorial: http://www.kwiksher.com/tutorials-kwik/creating-new-project-from-an-old-one-expert/. Which entries would you plan to edit in the build.settings file? This can be done already using variables. Would you mean retina support (what do you mean by that) and masking? Regarding masking, hopefully Corona PRO (with improved bitmap manipulation) will facilitate that. 3D objects are not available in Corona. For timeline, see answer 4. In page video already exists: check Video Replacements in the User Guide. 21) a better manual the workflow and a better layout for actions, interactions window so you can easily tell when certain items are not checked off correctly. Maybe something like item description on the left with checkboxes, user input on right all aligned with scrolling so one can quickly compare actions on one page vs another . just a thought. keep up the great work. I am always trying to improve the user experience. Suggestions noted. Can you please provide more info here? What do you mean by “good variables” and “external code tutor”? This is a hard one because several people ask for integration with different SDKs. Being a really small company it is very hard to find time/resources/money to invest in more than one platform. Kwik already offers that (Go to Page interactions). What else do you miss? 27) ability to do levels with saved player data, so player can resume where he left off. This can already be done with variables (and the track variable option). 28) when both use Drag and Physics, I’d love to switch Physics on/off. I need flip option to Path Animation. Both suggestions seems to be very particular. The first request can be solved with External Code. For the second one, this is really a trick one because, how will Kwik know when to flip (and in which direction) an object moving on a path? 29) Whichever one I need at the time I need it. Right now I would love to see an implementation of slider input. I will also need accelerometer controls. Mostly I don’t know enough to know what I don’t know. 31) it would be nice if i could publish single pages in the project, because making one change and publishing all the pages to see it in simulator is time consuming. This option already exists a while. Check the User Guide for more info. Corona Labs is working on a new version of it. As soon as it is finished, it will come to Kwik. Can you please provide more info here? What do you mean by better control of external libraries? Can you please provide more information here? 35) duplicating a dragable object, tutorials on how to use free APIs from Corona library , in app purchases btw, I think your doing a fantastic job though your alone – makes me want to help too. Do you have an affiliate program? Thanks for your comments! Search our website for tutorials on in-app purchase and how to use external libraries. At this moment there are no formal affiliate program but, if you see opportunities to sell Kwik by yourself, drop me a line and we will find out something. 36) Pinch and swipe simultaneously, video seen straight away as you place file, text enlargement for ePub publications, more text effects, text that flows into position say from the left right or up and down locations into a particular spot, easier way of creating the colouring section for a picture on a children’s book. Text will see improvements in the next releases for sure (hopefully Corona will improve the way they handle text as weel). Gestures are in the list, as well. Regarding “easier way of creating the colouring…”, why do you think the current way is not enough? Ideas on how to improve? 37) Lower price., I had recently started thinking about trying Kwik again when I received the email announcing a 2-year anniversary sale. 50% off? Great! Wait, no, it’s not. The regular price is more than I’m able to justify, and having a second license is of no value. You gotta do what you gotta do, but unless the price comes down I won’t be purchasing it. Price must be related to value. Several reports suggests that the average price of building an app goes up to $25,000. Kwik costs around 2 hours of a professional developer. I strongly believe that, if you are not a developer, $250 is nothing comparable what you would be spend hiring an external developer to create your apps (in plural because you can design/develop as many apps you want with Kwik). Take a look at do-it-yourself competitors and you will see they are charging $500-$1,000 per app! If you are a developer, think about how much time do you spend just positioning images into your code, re-writing similar functions and editing images. Multiply it by the number of several apps you make and, again, you will see that adding $250 into your workflow is a really good investment for your time. If you are a developer wannabe (there are several cases like that), Kwik “teaches” how to code in Lua for less than a regular online training. Again, value is perceived differently by different people. I have received suggestions from users (believe me, it is true) mentioning that I should increase the price due the constant improvements and the ability provide to them to speed up and/or reduce development costs. Thanks for getting back to us, and answering all of the questions! I too believe the price for kwik is on the cheap side. The catch I guess is buying Corona AND Kwiki that makes it “seem” more of an investment. But royalty free and allowed me to create several apps for iOS and Android without learning LUA, saved me not only time but way more than $250 paid for the plugin. I know several programming languages but did not have any interest in learning another for app development. It’s also a plus that I never have to leave my precious Photoshop other than to publish. Thanks for the great product and the impeccable support Alex! Thanks for posting the answers from your survey! Great to see what everyone else is saying. I made the comment about Social Media integration. I guess what I mean at this stage is to be able to use the fact that we can sign into Facebook and Twitter with iOS and be able to send a tweet or status update from within an app. Or be able to setup a button that would ‘like’ a Facebook page from within the app. Sharing a screen shot of the app to your personal Facebook account or directly onto the App or Company Facebook page would be great too. I’m sure I’ll think of more things, like we all do once we use Kwik more. Can’t wait to release my first App… soon! Few issues that are quite annoying while working in kwik(2.4.1) on animations (not story book) -so there is need of multiple animations on same objects based on timeline. 1. when you group few layers and add them an animation -> the layers will always be in front (no matter if its the last down layer in “photoshop layers panel”). The only way anything else could be in front of the group is when you put it inside a different group. 2. when you double click on the action or animation in kwik panel (you have to select the proper layer from “photoshop layers panel”, otherwise the animation will get crazy and you will not know where the layers are located. Now something i wish for: It would be great if there was a timeline… or you could work along with photoshop timeline or so. Hello Alex, I’m sorry I missed completing the survey. Please don’t listen to those wanting a lower price. What Kwik saves in development time and cost is well worth the price of the software. A quick note on ‘In-app purchasing’. I was at first excited when I saw kwik 2 had that option, then disappointed at how it was implemented. Here is a scenario I’d love to see. Take ‘amelia and the terror of the night’ for example (the lite version). When you go the menu it has rectangles of all the pages that are only available in the full version. They have question marks on them. When you click on one, a message pops up saying you can only access it in the full version. It doesn’t take you to the actual page for a preview. It’s just a simple popup. I’d like to see a similar working in-app purchasing where we can place such a popup on any graphic we want but it doesn’t take you to the page first only to redirect later. Then if an in app purchase is made to buy a full version, that graphic is replaced by another and a link added to it. In other words the graphic is unlocked. The way it works at the moment with the graphic simply disappearing isn’t ideal for me to use the feature. I’d like to see the disappearing image to be replaced with another and a link added as well. Hope that made sense. P.S I too would like to know ‘What is a kiosk app’?? Regarding iap (and the Amelia example), the light version does not have iap implemented. When you click the question mark button it simple shows it you an alert that points to the AppStore (you can do it in Kwik, for example, showing a window with the 2 button options, or adding external code for that – it is a simple call). As you noticed, Kwik’s implementation of iap is different. In this case, there is no need of 2 apps (light and paid version). Hi Alex! I think it would be good idea to add frame rate(lenth in seconds) for movie clip replacement. I wonder why it still doesn’t have it like in Sprite sheet replacement. Now Movie Clip is just useless thing for me, because I can’t control the speed, and I use Sprite sheet, but when I have a large sequence, it would be better to use Movie Clip. Thanks! Andrew, as you can see in the documentation http://www.kwiksher.com/learn-kwik2/mc-replacement/ Movie Clips are deprecated by Corona and will not see any future improvements. In fact, I strongly suggest people to not use them anymore. I read this post shortly after you did the survey (in which I participated). I just want to say that although it may not be very popular, I hope you will not abandon the multi-language ability of Kwik. Kwik is fantastic and keeps getting better. Thank you so much!